Custom built-in cabinets are a great way to enhance the beauty and functionality of your home or office. Designed specifically for your spaces and fabricated at our Houston facility, your custom built-in cabinets are perfect for every room in the house, adding style and maximizing your interior spaces without compromising your design aesthetic. The living room is often the central showpiece of a home. No matter how your home is decorated, custom built-ins add interest and value, whether you are displaying art, housing your book collection, integrating your home theater, or simply providing extra storage. We work with a wide range of materials and finishes to match every look – from the warmth of traditional hardwood to the clean, modern lines of high-gloss veneers, you can count on a seamless design integration that ticks all your boxes. Custom built-ins are practical and they can be designed to meet your needs, whether that is for storage in the kid’s rooms, storage/seating banquettes in the kitchen, or a custom wine storage room to house your collection. Built-ins can combine function with design, integrating lighting, space for electrical and technology, and even space-saving Murphy wall-beds for the guest room. In the bathroom, custom built-ins and vanities make the most of what is usually a challenging space, giving you plenty of space to store the necessities and room to grow. In the kitchen, built-in cabinetry provides you with a seamless look and feel, even allowing you to conceal appliances for a truly polished and unified look that flows. The mudroom is the place where everybody’s “stuff” seems to pile up. With custom built-ins, your mudroom or entryway will be organized and free from all the usual clutter while keeping all the necessities handy for easy access when you need them. Designed to be functional, mudroom built-ins can also be beautiful, matching perfectly with the rest of your home to deliver a sleek and appealing entryway that is as inviting as it is convenient. Do you have a great window you want to enjoy more? With a built-in window seat, you will have a perfect place to curl up with a good book and a strong cup of coffee. If you’ve been wondering what to do with that plain old wall surrounding the window, it can be reimagined with built-ins, giving you ample storage for books, photographs, keepsakes, an entertainment center or your vinyl collection. Where custom built-ins are concerned, the only limit is your imagination. Our work is well-known in Houston, as is our commitment to quality and integrity. We custom-design and engineer all of our built-ins, providing you with scale drawings of the plan so that you can see the end result before we even begin. This allows you to visualize different finishes, colors, and materials before you commit. Once we settle on a design, your built-ins are handcrafted at our Houston facility using only the highest quality materials. We offer a complete range of veneers and hardwoods for you to choose from and the possibilities are virtually endless. Even if you are the kind of person who has a hard time deciding, our designers and engineers can help you choose the configurations and finishes that will work best for your space. Ultimately, it’s about your satisfaction, it’s about value, and it’s about providing a result that is going to stand the test of time. 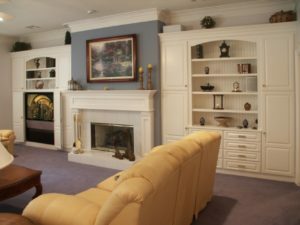 In most cases, custom built-ins raise the value of a home and they most certainly deliver the “wow” factor, meaning that whether you intend to stay in your home forever or if you are upgrading to sell, you are going to realize the value many times over. For superior craftsmanship and the highest standards of customer service, Jim Farris Cabinets is number one in Houston for quality custom built-ins for every room of the house. If you are thinking about upgrading your home or if you need to make your living spaces more functional without compromising your interior design, custom built-ins could be the answer. Call today to learn more or to schedule a consultation.